A celebrated stalwart in Singapore’s city centre, Pan Pacific Singapore’s multifaceted buffet restaurant, Edge, is one that never fails to take our breath away. Exuding a marvellous theatrical spread, the team of chefs bring to the fore flavours and delicacies from all over the globe with a menu that constantly changes and evolves. With 7 interactive live food theatres, 16 food stations (at least) and over a hundred dishes to choose from, this is one buffet restaurant that’ll push your appetite to the edge—literally. We’ve always been avid fans of their weekday buffets. And just when we think that things couldn’t get any better, they go and pull off something as incredible as a Sunday brunch that encompasses everything you could ever want in a perfect weekend from a botanical gin cocktail bar stocked with a wide selection of top-tier labels, premium seafood on ice, a temple of desserts and so much more. There’s something for everyone, even the little ones. From an onsite balloon sculptor to a newly furnished kid’s playroom that comes with their very own buffet spread, games and more, there’s no doubt that your little ones will be in for an epic Sunday. And while the kids are kept entertained, why not indulge even further with unlimited glasses of Veuve Clicquot Champagne, cocktails and G&Ts? Happening every Sunday from 17th March to 26th May 2019, this feast fit for a king is one that’s worth the splurge. Sundays are for sleeping in for many, but for us, a good brunch trumps the extra hours of shut-eye. For our readers, you may quote “ladyironchef” upon making reservations to enjoy the non-alcohol package at S$98++ adults, S$49++ Child, or the alcoholic package at S$178++ that’s inclusive of free-flow Veuve Clicquot Champagne. From the humble streets of Chinatown to the enclave of old Kampong Glam, PARKROYAL on Beach Road’s all-day dining buffet restaurant has long been known to deliver excellent renditions of local classics. Drawing inspiration from Singapore’s rich culinary landscape, the chefs here spare no effort in preparing a sumptuous buffet spread of mega proportions. 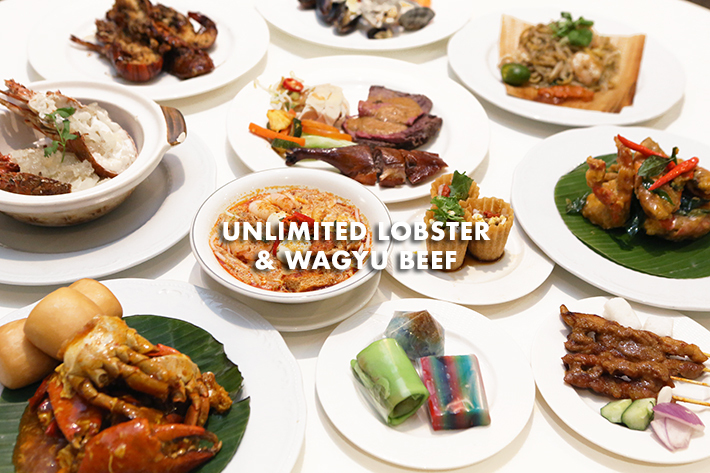 Their all-new weekend lunch and dinner spread—happening from now until 30 April 2019—encompasses cuisine spanning the far reaches of Southeast Asia from their Indonesian-inspired Wagyu Beef with Rendang Sauce, cult favourite, Salted Egg Yolk Crab and their all-new Claypot Rock Lobster with Fish Maw Soup that’s worthy of multiple helpings. Birthed from the hands of an experienced team of chefs, this weekend spread boasts a rustic, nostalgic appeal—one delicious mouthful at a time. If you haven’t quite gotten over the recent Chinese new year holiday, then perhaps some proper feasting is in order. And to make your weekend dining experience even better, our readers can quote “LIC25” to enjoy a 25% discount on the weekend lunch and dinner buffet! Charting a hawker-forward course to flavour town, Spice Brasserie—PARKROYAL on Kitchener Road’s all-day dining restaurant—is set to welcome an all-new spread dedicated to the very best of Singapore’s local hawker scene. Curated by Executive Chef Robert Chan, along with his culinary brigade of seasoned chefs, diners can expect unlimited servings of local must-haves from the classic street side favourites, Oyster Omelette, zi char staple, like Marmite Chicken as well as the crowd favourite, Slipper Lobster in Black Pepper Sauce. If you’re a die-hard durian fanatic, we promise you their sweet, decadent Durian Pengat with Sticky Rice is worth every penny. Guaranteeing a smorgasbord of mouthwatering delights all in one place and at a very reasonable price point, look no further than to Spice Brasserie from 14 February to 15 May 2019. And to spice things off even further, our readers can quote “ladyironchef” upon making a reservation to enjoy 25% off the lunch and dinner buffets. Nothing gets Singaporeans more hyped up than an opportunity to feast to their heart’s content at a buffet. Yet, dining at buffet restaurants are often a costly affair that—while enjoyable—does take quite a serious toll on one’s bank account. Hoping to stuff your bellies till your zippers burst with a multitude of premium-quality grub but don’t wish to burn a hole in your wallet? Here’s where eatigo comes in—offering the very same indulgent dining experience of a hotel buffet but at discounted prices, diners who make their reservations through the app get to enjoy up to 50% off their dining bills. What’s more, on top of the attractive time-based discounts, Standard Chartered Credit Cardholders are entitled to an additional S$5 Eatigo Cash Voucher off their dining bill! Already geared up to lay siege on the buffet line? Here are some hotel buffets in Singapore we recommend! A time of celebration and merrymaking, Christmas is the one holiday we look forward to the most every year, because we have a valid reasons to shop and feast like there’s no tomorrow. When you think of Christmas, you think of indulgence, you think of a celebration. Yet, while the year-end splurge is necessary during the festive Yule, it does not mean that you cannot cut back on over-spending either. To ensure that you have yourself a memorable holiday feast sans the overly hefty price tag, here is our list of 7 Christmas buffets in Singapore with special promotions that’ll make you go ‘ho ho ho’. We have dined at Ginger at PARKROYAL on Beach Road many times but they always manage to get us excited for our next trip back. When looking for an affordable buffet place that suits the dynamics of a multi-generational family or a diverse group of friends, Ginger at PARKROYAL on Beach Road will, without doubt, be on top of our list. Drawing inspiration from Singapore’s culturally-rich enclaves with many dishes being heavily influenced by Asian flavours and helmed by their new Executive Chef Vincent Aw, expect a wide range of new, exciting dishes that are perfect for your Christmas feasting. From 1st December 2018 to 1st January 2019, a sumptuous Christmas feast certainly awaits you here at Ginger, so put your diets on hold and get ready for the season of feasting! What’s more, our readers can quote ‘ladyironchef‘ upon making reservation to enjoy this lavish buffet spread at 25% discount from 1st December 2018 to 1st January 2019 (exclude blackout dates), and 15% discount on Christmas Eve, Christmas Day, New Year’s Eve and New Year’s Day. Should we have to name one restaurant in Singapore that constantly pushes boundaries in terms of both variety and quality, Edge at Pan Pacific Singapore would be it. Time and time again, Edge has proven itself to be an epitome of unfaltering quality and we wholeheartedly trust them to provide the best and only the best for all our special, important events. This festive season, revel in a merry splendour over at Edge, where multiple glorious wintertime roasts will be part of their buffet line-up alongside 7 live stations, 18 varieties of artisanal cheeses, a plethora of Asian and Pacific delicacies on top of an entire room dedicated to desserts to round it all off. And not to be missed is their life-sized gingerbread house that is constructed entirely out of real, edible gingerbread. Happening from 12 November 2018 until New Year’s Eve, this buffet only gets better—our readers may quote ‘ladyironchef’ upon making a reservation to enjoy 20% off Festive Lunch and Dinner Buffet from 19 November 2018 to 30 December 2018 (excluding eve of PH, PH and Sunday Champagne Brunches). Here’s why Edge is worth the splurge this merry season. The nature of food is such that it is oh-so subjective. The best way to accommodate everyone’s palate and varying preferences? An extensive buffet featuring a dazzling array of international cuisine with choices that will leave you in a huge dilemma. 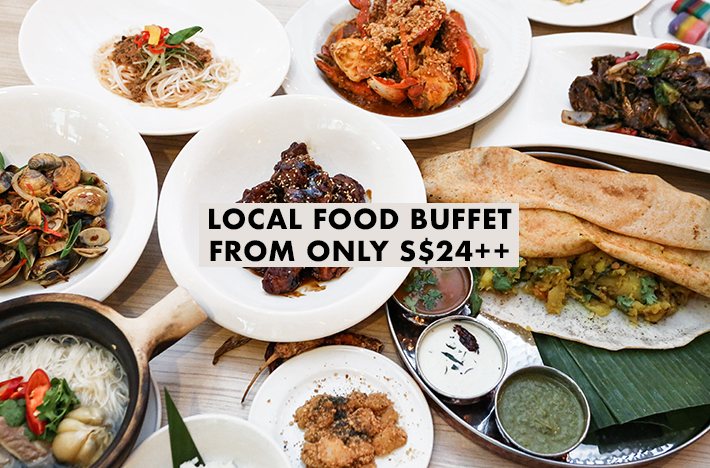 Singapore has no shortage of superb buffet spreads that lure you in with top-notch food displays, quality dishes and impeccable service by the amiable chefs. The smorgasbord of all-you-can-eat restaurants even includes Halal-certified options to cater to the expansive Muslim market. 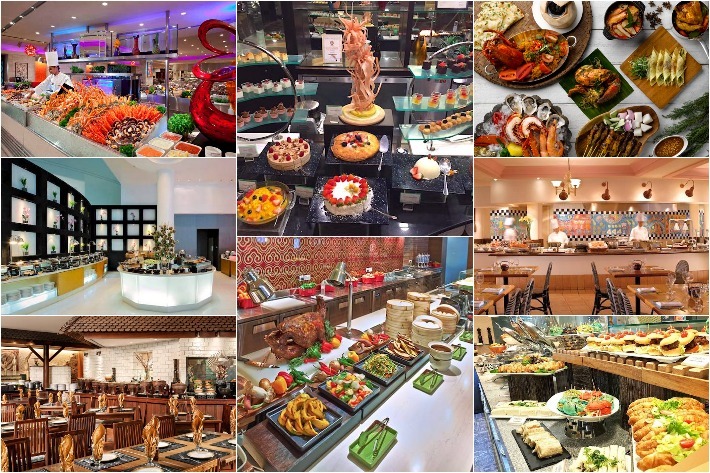 With a few of the halal buffets being relatively new, it is time you stop procrastinating the next meet up and check out these Halal-certified hotel buffets. Free-flow grub and a jolly good time? It really does not get any better than this!